A section of Iceland’s Eldgjá fissure as it appears today. Around 1,100 years ago, this place was hell. New research connects a powerful volcanic eruption—and a medieval poem that conjured memories of the dreaded event—to Iceland’s conversion to Christianity. This is Codex Regius, an Icelandic codex which contains the Vǫluspá. Prior to the new study, scientists knew about the terrible Eldgjá lava flood, but they couldn’t figure out when it actually happened. Estimates placed the eruption anywhere from 932 through to 939, with a best guess at 934 based on scattered evidence. To finally get it right, a research team, led by Clive Oppenheimer, collected data from ice cores and tree rings, showing that the eruption started in the spring of 939, and continued until autumn 940. Indeed, the Eldgjá lava flood, as its name and duration suggests, wasn’t any ordinary eruption. It happened in the southern region of Iceland along a 75-km-long (46 miles) fissure linked to the Katla volcano. The eruption threw massive amounts of lava onto the land, while spewing sulphurous gases into the atmosphere. An estimated 20 cubic kilometers of magma poured from the cracks. Needless to say, the eruption had an impact on Iceland’s inhabitants, who began to settle the island around 874. The settlers likely abandoned much of the island, or relocated elsewhere, as famine was probably severe, but no texts survived to tell us exactly what happened. But that’s where the poem could help, the researchers claim. A certain reading of Vǫluspá, dated to around 961, seems to paint an apocalyptic scene of the conditions both during and after the eruption—and even the onset of a cold volcanic winter (which was felt around the globe). [The wolf] is filled with the life-blood of doomed men, reddens the powers’ dwellings with ruddy gore; the sun-beams turn black the following summers, weather all woeful: do you know yet, or what? The sun starts to turn black, land sinks into sea; the bright stars scatter from the sky. Steam spurts up with what nourishes life, flame flies high against heaven itself. The poem also predicts the end of Iceland’s Norse gods, and the rise of a new, singular deity. Could this be construed as the conversion of Iceland to Christianity? The researchers think it’s a distinct possibility. That accounts of a severe volcanic eruption—one still seared in memory—were used to fuel theological debate and proselytize Icelanders in the 10th century is not as outlandish as it may appear. The arguments may have sounded quite compelling, and the new religion may have offered some solace and reassurance. Oppenheimer and his colleagues present a good case, but like anything, there’s likely more to it than a scary poem. 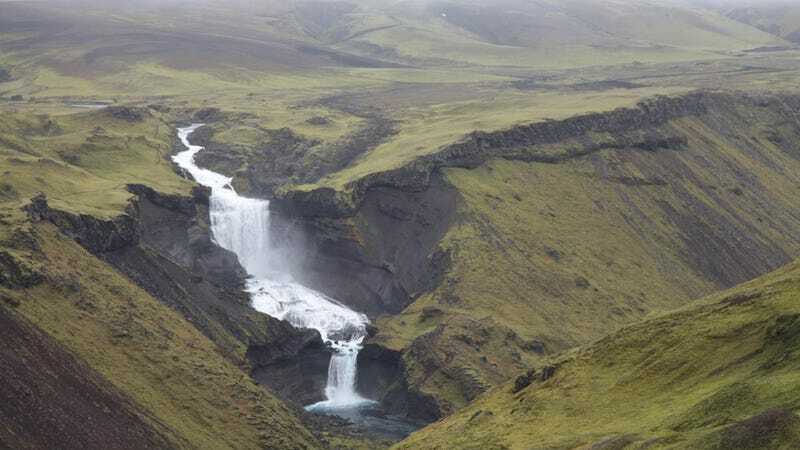 The reasons for Iceland’s conversion to Christianity are complex and multifaceted—the story of a horrible volcano quite possibly being among the many reasons why the Norse gods were abandoned.